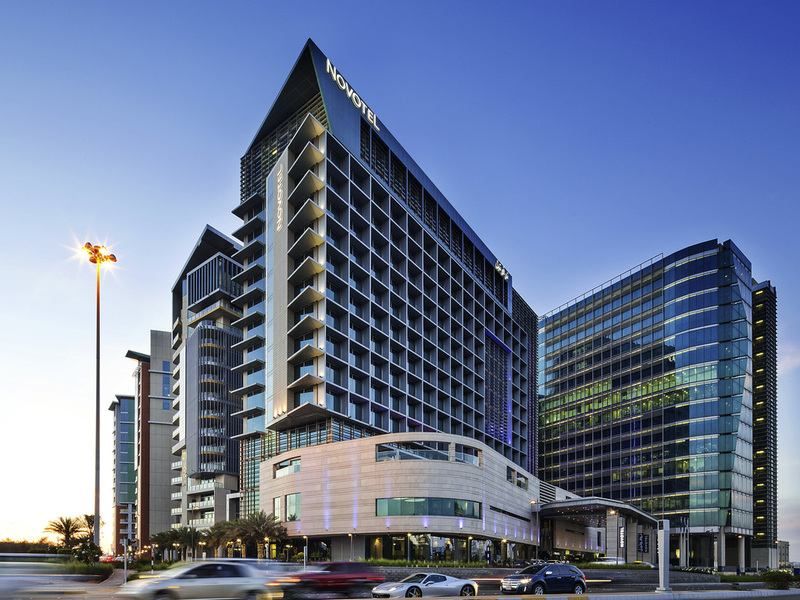 Novotel Abu Dhabi Al Bustan, a contemporary hotel in an exclusive neighbourhood for business and leisure. Unwind in our Fitness & Wellness Centre or relax by the outdoor heated pool. Meeting areas and ballroom available for all your event-planning needs. Enjoy discovering our exciting range of bars and restaurants at Novotel. Staying several days or just stopping over ? Do not miss out on what your destination has to offer, here are suggestion s for the essential things to discover, see and do. Spacious, contemporary design and adaptable, the Novotel room is truly a place for living. Perfect for all your needs. Spacious and contemporary design, the Novotel room is truly a place for living. Need more space, and amenities ? The Suite room will satisfy your needs. Offering early bird continental breakfasts and all day healthy treats. French pastries as signature items. Steak house restaurant staging charcoal grill with meat cuts, sea products and rotisserie. All day dining restaurant serving authentic Arabic, Indo South and Mediterranean cuisine from live cooking station. ADNEC (Abu Dhabi national exhibition center) 출장을 위해 머물렀음. ADNEC까지 도보로 30분, 택시로 10분 거리 (택시비 12 디람). 호텔 앞에 택시가 많음. 바로 옆에 슈퍼마켓이 있음. 대형 쇼핑몰인 Mushrif Mall과 1.6 km 거리 (걸어가기는 약간 멀게 느껴짐). 호텔 1층의 Bar에서 맥주 500 cc 최저가는 440 디람. Happy Hour인 오후 4~6시에 할인판매. 1층 야외 수영장이 넓고 전망이 좋음. 수심 1.3 m. 방에 슬리퍼는 없음. 냉장고가 비어있어서 장 본 것을 넣기 좋음. 커피포트 있음. 하루 일정의 피곤함을 단번에 풀어주는 안락함이 있었습니다. 감사합니다..
전체적인 룸 컨디션은 만족입니다. 다만 예전에 비해 흡연방의 경우 냄새가 좀 더 나는것같습니다. 또한 샤워실 수압이 너무 불안정합니다. 객실내 흡연이 가능하도록 되어있는데, 담배연기의 배기시설이 부족함, 새면기의 배수가 원활하지 못함. 그외 직원이나 전체적으로 만족함. 첫째날 투숙하면서 tv가 정상 동작 하지 않아 밤 늦게 정상적인 tv 시청이 가능했음. 중동의 더운 나라이더라도 밤 늦은 시간의 실내 온도는 감기에 걸릴 정도의 추운 날씨인데 히터 등의 난방 기구나 가습기가 전혀 없음. 조망권이 좋은 룸을 배정 받아 밖의 경치 구경을 하기에는 좋았음. 전체적으로 좋았으나 타월 및 티슈 등 몇가지 준비가 부족한 부분이 있었습니다 전반적으로 좋았습니다.